Perhaps the main role of pre-feed component is to provide a buffer for an operator loading parts into the system, which begs the first question: How long do you want the system to run before it needs to be loaded with more parts? Using the rate at which your process consumes parts along with the size of the parts we can calculate the capacity your hopper or elevator needs. It is common for high speed packaging lines to use large capacity elevators to provide an adequate amount of time between part loads, where as a relatively low rate bolt assembly feeder may only require a small hopper. Another important consideration is the part load height. Most elevators have a storage bin with a load height somewhere around 36”-48” or at least lower than the vibratory or centrifugal feeder load height, making it easier for an operator to load parts unassisted. A standard vibratory hopper load height, in nature, has to be above the top of the bowl which means if the table top is at waist level, the hopper load height will be at chest/neck level or higher. If there is a sufficiently raised platform for the operator to stand on or sufficiently low table top, the load height will likely be at a safe level. If, after some consideration, you decide an elevator is the best option for your feeding system you have to think about the weight of the parts the system is feeding. For lightweight parts, a standard pull-through style elevator may work well, as the cleats on the belt can easily pull through the storage bin to move as many parts as possible per cleat. If your parts are heavy, it may be necessary to use a vibratory hopper/elevator which combines the incremental addition of parts from a vibratory hopper with the load height and vertical conveyance of an elevator. Several other factors that are more difficult to quantify but still shape your decision on whether to use a hopper vs. an elevator (and which kind for each) include the size and shape of the part as well as the durability of the pre-feed system with your parts. Fortunately, we at Hoosier Feeder Company see a large variety of applications on a daily basis and can help you narrow down what you need based on your system’s requirements and the parts you intend to feed. 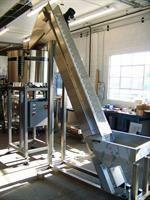 Never hesitate to reach out to us with your questions about the best way to pre-feed your automated process. Give us call, we would be happy to help you with your next project!